*A dark shadow is what he had seen at first, but then he saw light within it, her voice… Aister’s voice! It was definitely her!Aister had returned to the poor fox… he couldn’t quite make out what he was looking at, but he knew it was her. She appeared to be larger than life, probably an angel had come his way. His bloodlust for revenge had been pulled out from inside, only a spirit could do such a thing! Now, all Ares can think about is if what he saw was real, that golden light… akin to his golden mate’s fur color. Or maybe he was just telling himself that everything would be fine. It’s not something that a simple fox can understand regarding the reality of our cosmic realm. There is obviously more chapters, so why is there no active NEXT (it’s grayed out) taking us to the next chapter? The page I see when selecting chapter 2 looks like something was skipped in the story. Oh yeah, sorry about that. 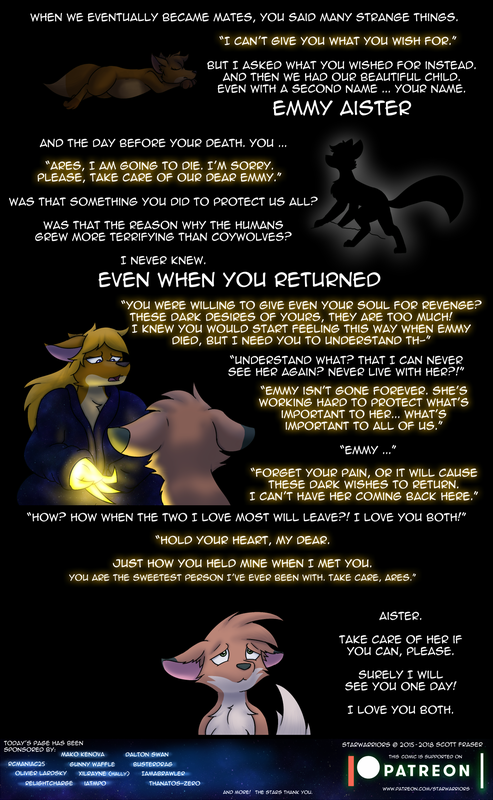 This is the most recent page of the comic. Interesting how Emmy got given Aister as her surname and not Ares. And Emmy’s mom actually went to get her herself killed? That’s mysterious! A question remains… if the hunter was a nice guy and only killed Aister in self-defense… why did he skinned her alive and left her there? !